There exists ancient Babylonian text, inscribed on clay tablets, that speaks of visitors from a planet called Nibiru who came to Earth, dug ditches that became great rivers, and spent thousands of years digging for gold. The document, known as the Arrahasis, also tells of a decision by the Nibiru to magically change a breed of Earth primates into an intelligent species to work as slave labor in the mines. The story strongly suggests that genetic engineering was involved, which explains the sudden appearance of Homo sapiens on the planet. Archaeologists and geologists have concluded that Homo sapiens first appeared in modern day form about 250,000 years ago in Africa, and from there, expanded in numbers until they occupied the entire planet. The Book of Genesis offers a similar myth. The story tells of giants on the earth called Nephilim who "came in to the daughters of man and they bore children to them. These were the mighty men of old, the men of renown." Greek mythology is filled with stories about gods that came down to Earth and interfered with the affairs of mankind. Indeed the old stories all appear to point to some kind of genetic work by an alien race that manipulated the genetic structure of a humanoid primate to produce the first remnants of modern humans. And if the Mesopotamian stories are correct, the purpose was to create slaves to work for the benefit of the "gods." Zechariah Sitchin, David Icke and Whitney Strieber are among the writers who gained notariety with their theories about a planet called Nibiru, or Planet X, that circles our Sun at such a wide arc that it enters our solar system once every 250,000 years. They have named our strange alien visitors as the Anunnaki . The writers also have predicted that this planet would be making a close pass to Earth again, may already be entering our solar system, and that it may soon play a role in a major change for all of mankind. It's a lot like Christians waiting for a return of Jesus. We've made such a mess of things everybody knows we could use some super beings to save us from ourselves. If they are truly coming back, we must hope they return with good intentions. Pressed back into slavery in the mines of Africa may not be well accepted. While Sitchin, Icke and Strieber had many followers,the theories also have been scoffed at by astrologers and others who have found no evidence that such a planet exists. But when it comes to the possibility of visiting alien races, there remains a large question mark. The old stories, the carvings found in caves, and the appearance of unexplained flying objects in our skies have all made us wonder if an alien race wasn’t involved in our past, and may still be keeping watch from above. Now a new book by Michael Tellinger, Slave Species of God, reveals the ruins of a massive metropolis that once existed in South Africa an estimated 200,000 years BC. The ruins, so far examined mostly from the air, spawn an estimated 10,000 square miles in a remote part of the southern African continent, about 150 miles from the coast. Found amid the ruins are thousands of primitive gold mines. The whole area appears to be located at the site of one of the riches sources of gold in the world. 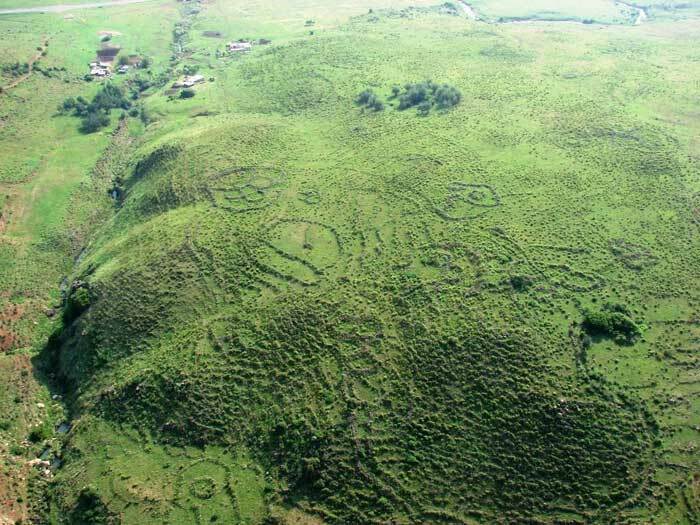 While known to local farmers who assumed the ruins were left by indigenous people of the past, the full extent of the site was not realized until area pilot Johan Heine, who had been flying over the area for years, pointed them out to Tellinger and the two men teamed up to examine them more closely. Tillinger wrote: "When Johan first introduced me to the ancient stone ruins of southern Africa, I had no idea of the incredible discoveries we would make in the year or two that followed. The photographs, artifacts and evidence we have accumulated points unquestionably to a lost and never before seen civilization that predates all others -- not by just a few hundred years, or a few thousand years -- but many thousands of years. These discoveries are so staggering that they will not be easily digested by the mainstream historical and archaeological fraternity, as we have already experienced. It will require a complete paradigm shift in how we view our human history." In his book, Tellinger thus joins a growing number of writers and researchers who are cutting away at the old religious oriented dogma that claims humans were produced by an omnipotent Creator and given dominion over the Earth and all of the living things on it. He suggests, based on the evidence found in those African ruins, that the old stories found on the Mesopotamian tablets may be closer to the truth than we dared admit . . . that we are the descendants of hybrid and manipulated primates created by alien visitors to work as slaves in those African gold mines. While humans appear to have evolved over the thousands of years that we have existed on this planet, the haunting question remains. Has anything really changed as to our status? Have we ever risen above the role of slaves to those that control our daily lives? Instead of gold, we now slave for materialism in factories and offices, doing tasks designed to generate great wealth for the masters who allow us to work for them. Indeed, we rose from surfs under kings and rulers who controlled the land and everything in it, to create democratic styled governments, but does this not merely cloak the same rulers behind a different disguise? Instead of ruling from castles and wearing velvet gowns and golden crowns, they now appear to us in thousand dollar suits after stepping from their limousines to the doors of their mansions where hired servants answer their beconing call.